Vanished?Liza Poole lives with her mother in one of the last balanced ecosystems in North America -- the Gumbo Limbo Hammock deep within the lush kingdom of the Florida Everglades. Some may think it strange to live outdoors, but Liza feels lucky to live it strange to live outdoors, but Liza feels lucky to live in her small yellow tent amidst tropical birds and exotic plants. And at the center of this natural paradise lies Dajun, the majestic alligator who protects Gumbo Limbo's environment. Then, one day, a state official arrives with frightening orders. Dajun is scaring people nearby -- he must be killed! 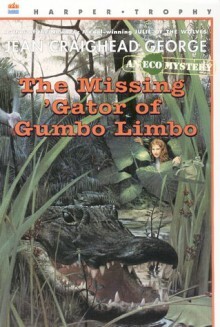 Liza takes action to save the invaluable 'gator, but suddenly, he is nowhere to be found. Now, she must find Dajun before it's too late, and her search will lead her into the heart of an exciting eco mystery!